While agreeing that there were some differences between Constantine and the players, Das termed the reported rift as a "bit of made up". All India Football Federation general secretary Kushal Das today gave enough hints that senior team chief coach Stephen Constantine would be handed a contract extension in March despite certain reports of rift with senior players. The AIFF general secretary also confirmed that Portuguese Luis Norton De Matos' contract will run till the end of the I-League, where he will be coaching the Indian Arrows. "His (De Matos) contract is till the end of I-League. Then we will see and discuss," Das told PTI on the sidelines of I-League launch. On the issue of Constantine, the general secretary dropped ample hints that the Anglo-Cypriot coach is likely to be rewarded for senior team's 13-match unbeaten streak including a berth in the 2019 AFC Asian Cup tournament. "It will be a decision of technical committee finally (in March 2018) but going by his (Constantine's) performance and results, I don't see any reason why he should not be continued," Das said. "I don't think there is any serious rift. I think it is probably a bit made up, may be he has had a bit of difference with some of the players but not a major issue. 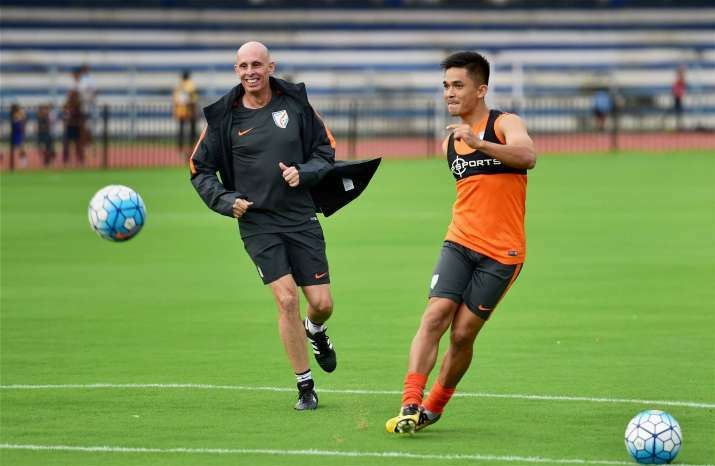 You have to accept the results under him and the fact that India have moved up to 105 in FIFA rankings and qualified for the Asian Cup," the AIFF top boss said.